In a Nutshell: Consumers In search of the best prices can become overwhelmed with the tediousness of comparison shopping among countless online retailers. At the same time, excessive marketing tactics and ever-present sale events can often dampen their excitement. 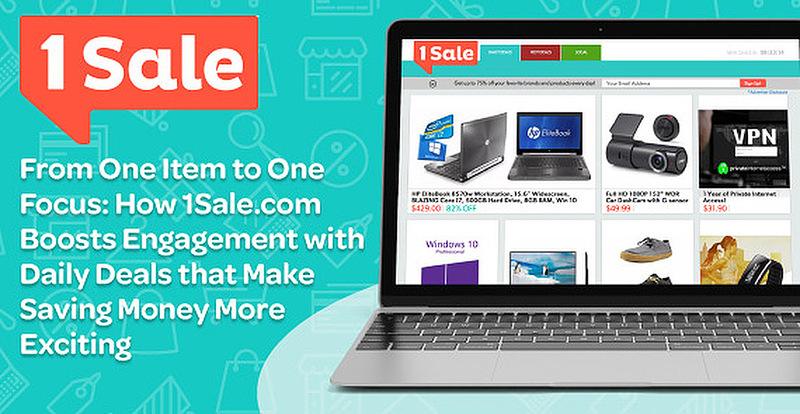 Since its launch in 2007, 1Sale.com has set itself apart as a daily deal website dedicated to bringing its users the best markdowns, which has helped it build a loyal following of millions of visitors. While 1Sale started as a consumer electronics retailer offering one deal per day, it now serves as a deal publisher that builds relationships with brands to bring the excitement back into savings with time-sensitive online specials and savings at local businesses. The rush of finding a great sale drives many consumers to comparison shop across a wide range of online retailers. As consumers sort through endless product listings and increasingly competitive marketing, the process of finding the best deal can quickly turn from exciting to tedious and overwhelming. Instead of shopping multiple retail sites for the best offer, closeout and deal-of-the-day sites have gained traction because they enable consumers to shop some of the best retail prices from around the web in one location. While these sites make it easier for shoppers to find competitive prices, building consumer excitement around deals has still proven challenging in an over-saturated market where free shipping, coupon codes, and formerly rock-bottom prices have become much more commonplace. 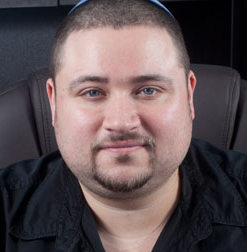 Ben Federman, Founder of 1Sale.com, wanted to bring value and excitement to deal-seeking consumers. This is the challenge Ben Federman faced when he launched his own daily deal business in 2007. Having recently returned from serving in the US Army, Ben was looking for a way to build a business and decided to combine his passions: deals and consumer electronics. He called it 1SaleADay.com, and started, as the name implies, by selling just one item each day. Ben started offering daily deals below cost on the revamped site — 1Sale.com — and it began attracting attention. As his site traffic picked up, he used the numbers as leverage to negotiate deals with small manufacturers so he could make a profit while still offering his customers deep discounts. By committing to bringing the very best deals to its customers, 1Sale sets an example for other brands of how to successfully build consumer excitement and loyalty that will drive business forward. Until 2014, 1Sale was itself a retailer, buying and selling merchandise distributed from its own warehouses. But, as the company grew, so did overhead costs. To allow the company to continue to drive rock-bottom deals, 1Sale changed its identity and approach. Part of 1Sale’s relationship with retailers includes offering them feedback on their sale categories, items, and prices. Based on its years of experience and feedback from its own customers, 1Sale has firsthand knowledge of what builds excitement around a deal. By utilizing its experience in the daily deal space to guide retailers’ decisions, 1Sale is helping others build their businesses and maintain customer engagement, fulfilling its mission to bring the best possible price to the consumer. To keep customers coming back to their websites, many retailers bombard users with constant sale notifications through email, social media, and smartphone apps. This over-marketing leads to disinterested customers who know that, if they miss one “limited-time” sale, there’s sure to be another one soon, if not the very next day. With 1Sale, users know that if they get a deal alert, it’s time to take notice – and act fast. As a daily deal publisher, 1Sale keeps consumers coming back in a few creative ways that capitalize on user desire for truly limited-time offers. 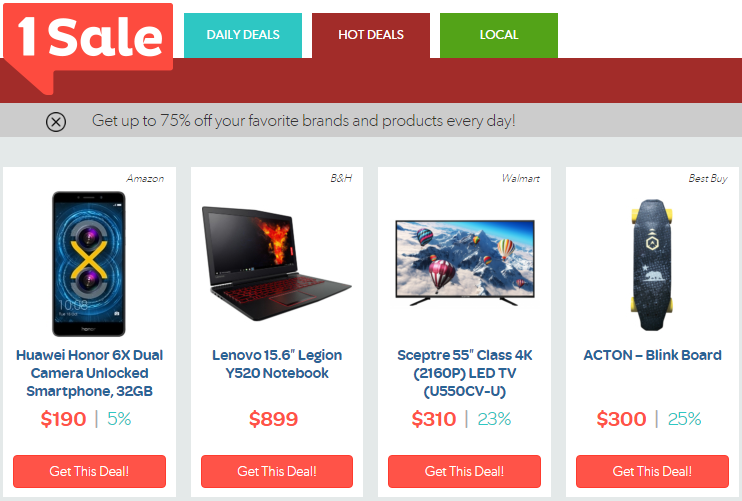 First, 1Sale’s home page displays a countdown timer in the upper right corner that keeps visitors aware of when it plans to release a new batch of deals. Another practice that resonates with 1Sale users is a special event it calls a sell-off. 1Sale also helps consumers get the most out of major online retailer events like Prime Day. Although Amazon does its own promotion of its one-day deals, it can be daunting for consumers to look through pages and pages of items in search of the best finds. Savings of up to 90% or more can sometimes be found in the 1Sale Hot Deals section. Prime Day offers and other hot deals tend to sell out fast, so there’s potential for customers to be disappointed when they click on an exciting offer that leads to an out-of-stock notification. Even though they aren’t in control of the sales they publish, 1Sale does its best to keep its information accurate, using tracking technology to check each item’s inventory in real time and update its listing to reflect what’s available. 1Sale’s primary objective is to be the place consumers go to find the hottest deals on the web, and, to do so, the site needs users to participate in the process. Although 1Sale focuses most of its attention on merchandise deals from online retailers, its local deals page features savings on merchandise and services from smaller business. 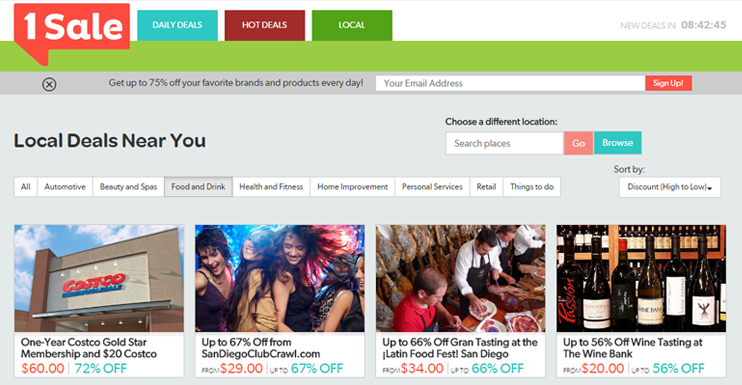 1Sale also offers local coupons so users can find deals from small businesses in their area. On the local page, users can type in their location and browse nearby offers from automotive shops, salons and spas, restaurants, gyms, and home renovation specialists among a host of other retail categories. By featuring deals that might otherwise only show up in localized advertisements, 1Sale bolsters small business engagement and gives users a one-stop destination for savings on not only merchandise but everyday services within their communities. 1Sale got its start building consumer excitement around savings on one item each day, but it didn’t stop there. By expanding its daily sales then partnering with retailers to advertise more items and categories, 1Sale has succeeded in extending the appeal of rock-bottom pricing and limited sale windows to a diverse range of consumers. Broadening its audience has also led 1Sale to recognize the importance of personalizing and streamlining its website. Currently, it’s redesigning the site to improve categorization and add browsing capabilities that cater to the individual. By staying rooted in its commitment to bring the best deals to consumers, 1Sale shows how retailers can engage their customers in authentic, simple, and fun ways that keep them coming back, excited for the next great deal.